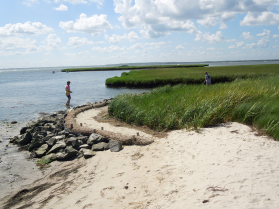 A Systems Approach to Geomorphic Engineering addresses ongoing and future coastal dynamic landscape change and threats, and supports coastal transformation by integrating green and gray solutions to contribute to the resiliency of our communities, ecosystems and shorelines. Our coastal communities and shorelines are facing escalating risks from more frequent and more powerful storms, sea-level change, and changing precipitation patterns that can result in dramatic economic losses to impacted communities and the country. SAGE is an initiative that brings together experts and practitioners from the federal, academic, non-profit and private sectors to pursue and advance a comprehensive view of shoreline change. This community of practice will facilitate the development and application of hybrid engineering approaches that link 'soft' ecosystem-based approaches (green) with 'hard' infrastructure approaches (gray) to enhance the resiliency of our coastal communities and shorelines. The intent is to reduce impacts from the consequences of land cover and climate change through prevention, mitigation and/or adaptation. This community of practice will build on the "living shoreline" concept and identify combinations of natural ecosystems and built infrastructure that best protect coastal communities and shorelines, while also improving economic outcomes and provision of ecosystem services. The application of integrated green and gray infrastructure elements in landscape transformation will require improved analyses that reflect interrelationships of ecological and economic benefits. Applications will draw from an understanding of existing science, engineering, economics and policy activity in this arena both domestically and internationally, and contribute to developing strategies to better identify and validate best practices.